Salerno: Ideal holiday resort for day trips to the Amalfi Coast and Pormpeii. Salerno is a city about 30 kilometers as the crow flies southeast of Naples by the sea. It is a large city with about 140,000 inhabitants, the second largest city in Campania after Naples. 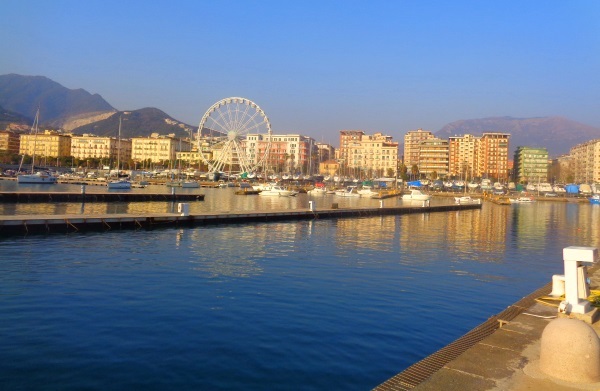 From our point of view, Salerno is an ideal place to explore the sights of the area, a good choice for a holiday resort. We often spend a few days in the city. Why are we going on holiday in Salerno? Salerno has many advantages. It is a clean and safe city for the south of Italy, very different from Naples. 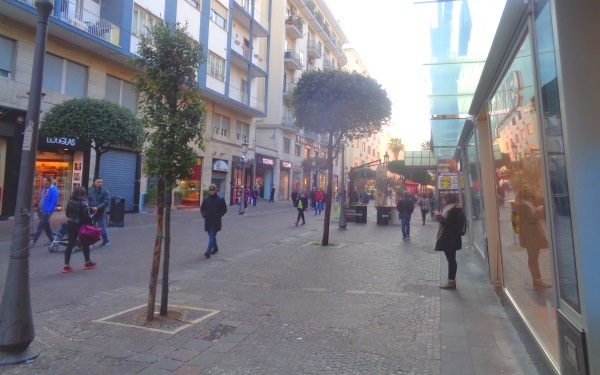 Salerno has one of the longest pedestrian zones in Italy, ideal for shopping. There is also a beautiful old town with narrow streets, nice cafes and small restaurants. But the most important thing is the location. Ferries to Amalfi and other places on the Amalfi coast depart almost every hour from the city centre. In Pompeii you are in a good half hour by train. Also to Naples it is only about one hour by train. There are direct ferries to Capri. Vesuvius is also easy to reach. Thus, from Salerno you can reach all highlights of the region without problems in half-day excursions or day trips. Moreover, many accommodations Salerno is somewhat cheaper than in other holiday resorts of the region. The city centre runs along the sea. Behind the shore is a very beautiful and long promenade for pedestrians. The second parallel road to the sea is the wide pedestrian zone of Salerno. From the train station it is about 200 meters to the sea. Here is also the harbour for the many ferries to the Amalfi coast (about every hour during the day). Beware, in winter the ferries do not run (only about April to October). There is also a bus along the legendary Amalfi Coast road from Salerno to Amalfi (about 100 minutes, departures at least every hour). There you can change to Sorrent (Sorrento), another 100 minutes drive. There are 1-2 trains per hour to Naples via Pompei. There are trains also further south. Some people take a trip from Salerno to the holiday resort Agropoli (about 50 km). There are also direct ferries to the island of Capri from Salerno (about 2 hours). From our point of view, Salerno is a city between a small town and a big city. For the south of Italy Salerno is very clean. There are also much fewer homeless people, beggars and run-down houses etc. than in Naples. Most tourists in the city are here mainly because of the very close Amalfi coast. Of course you can do all the above mentioned trips with a rental car. You can spend the night in Salerno for a reasonable price and eat a bit cheaper than in Amalfi or Sorrento. In Salerno you should choose an accommodation close to the railway station and the harbour if you want to make day trips by public transport.